About: The Red Lion pub hasn't changed for over 160 years and the hand carved mahogany decor inside the Grade II listed building still remains. It was voted 'Most Authentic Pub 1999' by Camera. They serve a variety of bar snacks and traditional pub food and can cater for private parties upon request. Outside seating is provided on the pavement. "Possibly the finest Fuller's pub in London thanks to a dashing Victorian interior"
With London in amidst something of a gin revolution, we’ve been hearing a lot about Victorian Gin Palaces recently. These ostentatious saloons were something of a leveler when it came to society in the past. In amongst the polished glass dividers you’d find lawyers alongside builders, proving that the mighty ‘mother’s ruin’ never discriminated over class. Bringing it back to the present day, we recently stumbled across the charms of The Red Lion, a little pub with a lot of style on a little alley just off Jermyn Street. And with a location slap bang in the middle of one of London’s most historic sartorial locations, it’s a good job that it’s more than a match for the three-piece suits, cordovan leather shoes and cravats that you find floating around this area. The Red Lion on Duke of York Street has been called one of the finest examples of the old Victorian Gin Palaces that remains and even if you’re not an expert it’s not hard to see why. Although this is a solid Fullers pub with the usual Honey Dew, London Pride and ESB on tap and the same old solid pub grub menu, the interior is from another world. A sea of etched glass, glimmering mirrors and wood create the unusual structures that divide the pub into separate sections. The walls are covered from floor to ceiling in old trinkets and the central bar itself is just as attractive as any of the furniture. Provided the local workforce isn’t flooding the floor space this is a great place for a central London date. It isn’t as obvious as a cocktail bar, it’s cheap (which can be very important) and it proves your knowledge of a true hidden gem. 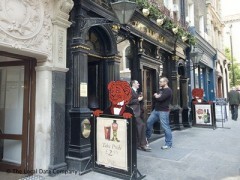 It may be the most popular pub name in London but this Red Lion is out on its own. Love, love, love this pub even if it is only for the decor inside. It can get a little busy with workers from around Jermyn Street but its worth fighting through the throngs for the ancient looking interior. Always good to take a visitor here. The most amazing place ever, great staff, great beer, great atmostphere would highly recommend it. Whilst the ambience and setting of the pub is perfectly pleasant, I found the staff ill-tempered, ill-mannered and snappy. Not an ounce of courtesy was displayed by the staff, and service seemed to be more of a chore than a necessity. Not a pub I ever intend to return to.